Joe Manganiello can be a scary dude. I've stood next to him. He's nice and all, but I wouldn't want to see him angry. 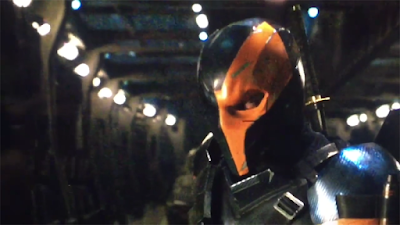 With all of the delays that have hit The Batman, his role as villain Deathstroke has been up in the air. Nobody seems to know what's going on, and with a brand new script being hammered out by Matt Reeves who knows if Deathstroke is even in it. "I think a lot of people are wondering what the status of Deathstroke is in the next Batman movie now that Ben Affleck is off the project as director. Do you have any information about that? It’s not up to me. That’s a good question for Warner Bros. and D.C."
So who knows where this is going. It's entirely possible Deathstroke has been written out, or that his screen time has been slashed. There used to be rumors he'd debut in Justice League first, but you don't hear anything about that now. Whatever the case, I think we may hear before long that Manganiello has moved on to a different project. There may be an opening to play Batman, I hear? The Batman doesn't have a release date but will likely open in 2019.